Official artwork of Skull Kid from Hyrule Warriors Legends. Skull Kids (スタルキッド, Stal Kid) are recurring characters in The Legend of Zelda series. They appear in Super Smash Bros. Brawl as stickers. The one from The Legend of Zelda: Majora's Mask appears in Super Smash Bros. 4, wearing the titular mask, as an Assist Trophy. Skull Kid casting a spell in Majora's Mask. Skull Kids first appeared in The Legend of Zelda: Ocarina of Time as minor characters, but one returns (specifically, the one who befriends Link once he plays Saria's Song to him) in Majora's Mask as the main antagonist in the game under the control of Majora's Mask. This Skull Kid is the basis for Super Smash Bros. 4's Assist Trophy. 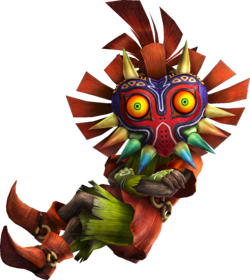 A Skull Kid (thought to be the same one as he knows Saria's Song) also appears as a minor character in The Legend of Zelda: Twilight Princess as a miniboss. The Skull Kid's attack as an Assist Trophy is not based on any known ability of Majora's Mask itself, although Skull Kid has been seen using the power of the mask to curse people for his own amusement. Two of his attacks, however, have a mechanic that makes reference to the Stone Tower and its respective temple, which must be inverted for Link to progress. Skull Kid himself did not appear, but he was mentioned in the description of the Four Giants trophy and the Majora's Mask trophy. Skull Kids appear on two stickers in Brawl. The Skull Kid in Super Smash Bros. for Wii U.
Skull Kid flipping the screen. Flips the camera upside-down, as well as mirroring it. Reverses all directional inputs for all players, so left is right and up is down. This does not apply to taunts. The Skull Kid trophy as it appears in Smash for the 3DS. The Skull Kid trophy as it appears in Smash for the Wii U. It's said that children who get lost in the forest are turned into these music-loving little monsters. In Smash Bros., you can summon one who's sporting Majora's Mask. It'll move into the background and bring down a world of chaos on the whole stage. Even the fighter who summoned him will be affected, so try to keep a level head! Skull Kid once again returns as an Assist Trophy from Super Smash Bros. 4. Training Mode describes his Assist Trophy: Does disruptive things like turning the stage upside down or making fighters invisible. Can't be KO'd. When playing on the Spear Pillar stage, Assist Trophies containing Skull Kid will not appear. He is also the basis for a costume for Mii Brawlers. Skull Kid in action in Super Smash Bros. for Wii U. Usually, when Skull Kid makes the fighters invisible, they stay invisible upon losing a life. However, if this happens in Smash Tour, the newly-respawned character will become visible. If Skull Kid flips the screen in Training Mode, the training menu and info will also be flipped. Conversely, if a character is out of the camera's view and taking hoop damage during a standard match, the hoop will point at the character's actual location, instead of following the flipped camera view. Skull Kid is one of the few Assist Trophies to be revealed on the Super Smash Bros. Ultimate website rather than in a Nintendo Direct. This page was last edited on April 17, 2019, at 03:49.